Huawei's Honor has launched Honor 8X smartphone with the following prizes and key features. This is one of the successful X series smartphone from Honor. 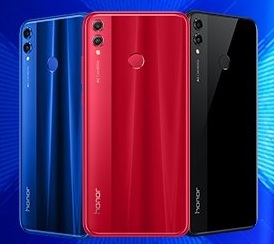 Honor has launched couple of mobile phones recently with three different ranges, one is cheapest one under 10k (like Honor 7S), the second one is mid-range one on around 20k (Honor 9N) and the other one is around 30-40k (Honor 10) premium cell phones. Here it is all about mid-range mobile phone - Honor 8x. Side by side, there was a news that Honor 8X Max also be launched but no news about it yet. If you are looking for Honor 8X price, key features, technical specification, first impression, review, unboxing, comparison and hands-on etc. then you could find some of them over here. The Honor 8X comes with 6.5 inch display with Kirin 710 processor with GPU turbo feature. The new chipset (Kirin 710) in this device paired with 4/6GB of RAM variant. The internal storage of the phone is of 64/128GB with an expandable option. The device runs with the latest Android Oreo operating system beside its EMUI os. Honor 8x comes with 6.5 inches (huge) display compare to other 6.4 or 6.3 inches gadgets available around. Honor 8x equipped with 16 megapixel front camera and 20+2 megapixel rear lens including for better low-light photo or video result. This could be one of the best smartphones in 2018 like its successor Honor 7x was in 2017. You can check the latest phone's specs and price detail below. Please feel free to ask your question, or, promote this post. Honor 8X price: 14999, 16999, 18999 (4/64, 6/64, 6/128 respectively). Tips: One of the best smartphones to go with one of them.